Well I ran across another picture to amuse you. This one I know came from March of 1977. 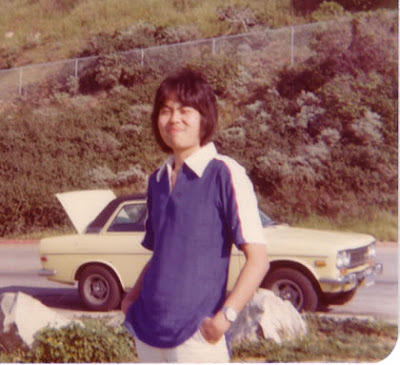 That's me wearing what at the time was my favorite shirt, standing in front of my first set of wheels - a 1972 Datsun 510. Yup, before they became Nissan. At that point in my life I had just finished my first semester of student teaching. Out of UCLA with a BA in Sociology, those four years gave me no clue what I wanted to do, so those who can't do.. well, they teach, right? I added a 5th year to get a teaching credential. I defended my decision - teaching was something I really wanted to do, I said. But in reality it was more like I didn't know what else to do. Now please, don't think I am knocking teachers because I am not. That is a totally honorable and admirable profession for those who feel the calling for it. I thought I did, but in the end - teaching not for me. This is a continuation of yesterday's post. I can't complain about my lot in life because overall, life has treated me very well. When I've stumbled, it's been my own fault. But it seems I've sort of stumbled into everything, without following my true passions, perhaps because I never took the time to figure it all out and then be diligent about pursuing them. I started out in elementary school as an excellent student. Same in junior high. I did all the assignments, worked hard for the grades and got them. But it was doing them for the sake of doing them - I learned a lot but nothing really set me on fire. It's been a long time since the sixth grade. I don't think you've changed much, you're still as intelligent as ever - but I think you can use your brains more than you have been. (I don't mean to criticize). Well good luck always - Elaine Murakami. You know, when I read that I was pretty upset because, after all, that's not the kind of thing you write in people's yearbooks. But part of my being upset had to do with the fact that I knew it was true. And worse, it was immortalized in ink for others to read. Through the years, I forgot pretty much everything people wrote because for the most part, people write the same old stuff. But I never forgot what Elaine wrote. Looking back on it, I appreciate her honesty. I knew she wrote that because she cared about me and thought I was wasting whatever talent I appeared to have. That's the kind of person she was - I didn't know her that well but I knew she was the type of person you could always trust, no matter what. I stopped being upset long ago by what she wrote. Like I said, I knew it was true. There's no pointing fingers and also, like I said yesterday, there but for me go I.